Regular Verbs | What Are Regular Verbs? A regular verb is one that conforms to the usual rule for forming its simple past tense and its past participle. In English, the "usual" rule is to add -ed or -d to the base form of the verb to create the past forms. Use the buttons to form the past tense and then the participle of the regular verb shown. Regular verbs contrast with irregular verbs, which form their simple past tenses and past participles in a variety of ways. 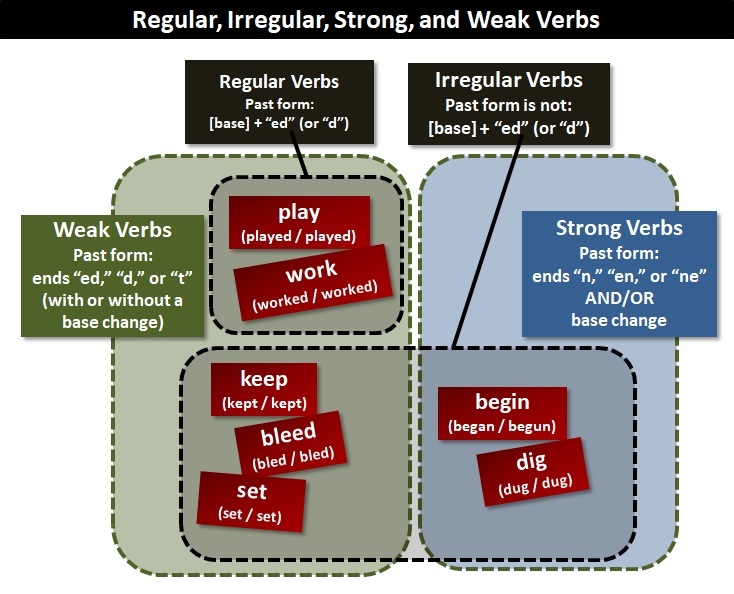 A regular verb is a type of weak verb. The terms regular verb and weak verb are not synonyms (i.e., they do not mean the same). Similarly, the terms irregular verb and strong verb are not synonyms.